Judge Audrey J.S. Carrión, Director of Business and Technology Program, took office as an Associate Judge of the Circuit Court for Baltimore City in November 10, 1999. Judge Carrión served as the Judge in Charge of the Family Division — Domestic from 2003 until 2009. From January 11, 1996 to November 9, 1999, Judge Carrión was an Associate Judge of the District Court of Maryland. She is a graduate of The University of Baltimore, School of Law. Judge Carrión was Chair of the Judiciary’s Committee on Court Interpretation and Translation Services from 2002 — 2014. In 2010 she was assigned to the Business and Technology Case Management Program and became Director of the Program in 2012. She attended the Economics Institute for Judges held at Northwestern University in October 2012. She is a member of the American College of Business Court Judges. She served as an ABA Business Law Section, Business Court Representative from 2012 — 2014. She is the recipient of several awards to include: 2012 EBLO Jose Ruiz Achievement Award; 2011 The Daily Record Leadership in Law Award; 2011 The Maryland Hispanic Bar Association Outstanding Achievement Award; 2010 Women’s Law Center — Rosalyn B. Bell Award; 2008 Excellence in Leadership Award, University of Baltimore, Women’s Bar Association; Maryland’s Top 100 Women for 2000 and 2003, The Daily Record; the 1998 Alumna of the Year Award, University of Baltimore School of Law; 1998 Presidential Award, Bar Association for Baltimore City; and the 1993—94 Award of Achievement, Bar Association of Baltimore City, Young Lawyer’s Division. Judge Yvette M. Bryant, is a 1983 graduate of Towson University, where she received a B.S. in Business Administration, with a concentration in Accounting. She graduated from the University of Maryland, Francis King Carey School of Law in May 1986, was admitted to the Maryland bar in December 1986, and was admitted to The District of Columbia bar in 1989. Judge Bryant began serving in the Baltimore City Circuit Court in July 2006. Prior to her appointment, she practiced in the area of civil defense litigation and, at the time of her appointment, was a principal in the Baltimore firm of then known as Bryant, Karpinski, Colaresi & Karp. After being appointed, Judge Bryant served in the Circuit Court’s Family Division from July 2006 until December 2016, and served as Judge in Charge of the Family Division from January 2009 through December 2016. Currently, Judge Bryant serves on the Maryland Court of Appeals’ Standing Committee on the Rules of Practice and Procedure, serves on the Executive Board of the Alliance of Black Women Attorneys, and serves as a Truancy Court Judge in Baltimore City through the Sayra and Neil Meyerhoff Center for Families, Children and the Courts of the University of Baltimore School of Law. Judge Lawrence P. Fletcher-Hill, took office as an Associate Judge of the Circuit Court for Baltimore City in March 2009, and was assigned to the Business and Technology Case Management Program in January 2015. He is a graduate of Princeton University and Yale Law School. Before appointment to the bench, Judge Fletcher-Hill handled complex civil litigation, including class actions involving civil rights, employment discrimination, insurance, and financial services, both in the Maryland Office of the Attorney General and in private practice at Gordon Feinblatt, LLC. He is a member of the American Bar Association, Maryland State Bar Association, and Bar Association of Baltimore City. Judge W. Michel Pierson, took office as an Associate Judge of the Circuit Court for Baltimore City in January 2004, and was assigned to the Business and Technology Case Management Program in September 2008. He is a graduate of the University of Maryland School of Law. Judge Pierson served as the Chair of the Civil Law and Procedure Committee of the Maryland Judicial Conference from 2005 until 2008. He is an Elected Member of the American Law Institute, and a member of the Federal Bar Association (president, Maryland chapter, 1992-93), American Bar Association, Maryland State Bar Association, Bar Association of Baltimore City, and J. Dudley Digges Inn of Court. Judge Pierson is a Fellow of the Maryland Bar Foundation and the Baltimore City Bar Association Foundation and a member of the American College of Business Judges. Judge Pamela J. White, took office as an Associate Judge of the Circuit Court for Baltimore City in February 2007, and was assigned to the Business and Technology Case Management Program in February 2012. She had practiced civil law, especially employment and business torts litigation, for thirty years with the law firm of Ober, Kaler, Grimes & Shriver, P.C. in Maryland, Washington D.C. and New York. Before her appointment to the trial bench, Judge White was a long-time Arbitrator designated by the American Arbitration Association for Employment, Commercial, and Large Complex cases. Her work as a Mediator included employment, business and technology matters. Judge White was a frequent author and course instructor on employment matters, workplace issues, and legal professionalism concerns. 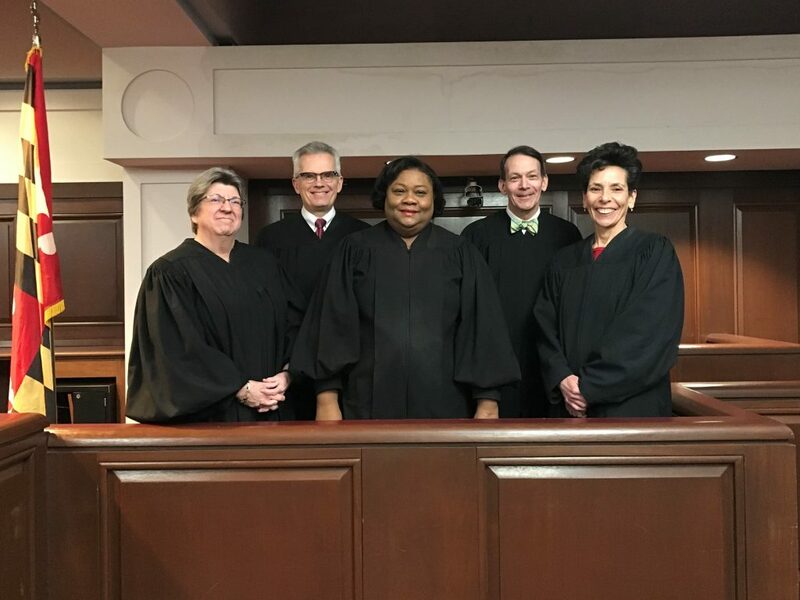 Judge White has served as President of the Maryland State Bar Association, President of the Women’s Bar Association of Maryland, Bar Examiner, Maryland Legal Services Corporation Board Director, and on numerous commissions, bench and bar committees. Judge White is a Distinguished Alumna of both Washington and Lee University (J.D. 1977, Honorary Doctor of Laws 2013) and Mary Washington College (B.A. 1974), and she has served on the Boards of both Universities. Judge White was named Judge of the Year (2014) by the Maryland Commission on Access to Justice.